The Rocket Stove was another option for heating and cooking we did extensive research on before arriving in Cape Town. The Rocket Stove had previous successes in a similar settlement in Rwanda, so we believed it could be a solution in Monwabisi Park. The fire chamber and chimney are made using either banana stem or PVC pipe that can be bought for around three to four US dollars. 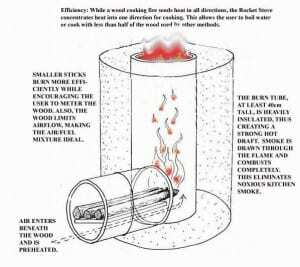 The dimensions of the chimney and combustion chamber are critical to maintain a smokeless stove. Research has shown that rocket stoves reduce carbon dioxide emissions as well as emissions of particulate matter in comparison to paraffin stoves (Drouin, 2008). Since these stoves use wood, concerns associated with burning paraffin would be eliminated. Despite these benefits, we determined that a rocket stove would not be an appropriate solution for Monwabisi Park in particular because of the lack of wood within the park. After just a few days in Monwabisi Park and speaking with our co-researcher, Siya, we realized wood was not readily available. In addition, the Wolfgat Nature Reserve is located in the back of the settlement, so implementing a rocket stove would only encourage the residents to illegally collect wood from there. In another location, where wood is more readily available, this would be an option worthy of pursuing.